For those who don’t know, a sleeve tattoo can be either a large tattoo or just a collection of smaller tattoos joined together into one huge design which covers from the shoulder to the wrist area. In fact the term “sleeve” is basically a comparison of similarity to having a long sleeved shirt. Although this term is also used for people getting the area from the knee to the ankle tattooed as well. 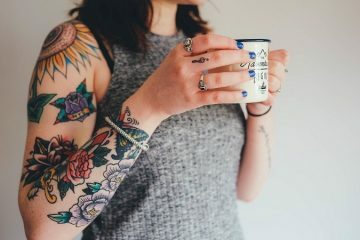 Half sleeves and a whole new world of different terms were then created to describe every form of sleeve worn by the selected humans on their skin. 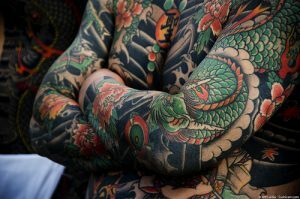 Yes, I do believe that we tend to make our lives more complicated by setting several terms for every single thing … But anyway, if you’re impressed by sleeves, then prepare to be mesmerized by Irezumi. 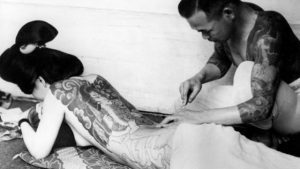 The question is, what is Irezumi? By now, some are curious and others most probably just got tired and just looked up the term on the internet. Irezumi is a Japanese word that refers to getting tattooed. Still, I was impressed by the definition I found. A decorative mark … A perfect definition of how a tattoo should be referred too. Brushing back on Japanese history, it is thought that the first form tattooing in Japan dates back to the Jomon and paleolithic period, approximately 10,000 BC. Some scholars have suggested that the patterns and markings seen on the faces and bodies of distinctive figures, represent tattoos. Although this statement is not endorsed by everyone, several similarities have been observed between these markings and traditional tattoos observed in other cultures in the same period. In the Yayoi period which dates approximately 300 BC – 300 AD, several tattoo designs were observed by the Chinese. These designs were though to represent spiritual significance as well as status symbols. Until the start of the Edo period, the role of tattoos in the Japanese society was still fluctuating. Tattoos were still used on criminals and only the daring few opted for the spiritual, decorative tattoos. In the Edo period, and it’s one of the main reasons I love this period, the Japanese decorative tattooing style began to develop into the advanced levels of practice seen today. The development of the art of woodblock printing and the release of the Chinese novel Suikoden, was the necessary momentum needed to rue the Japanese to opt for decorative tattooing like their ancestors. Suikoden, was a tale of rebel courage illustrated with woodblock prints portraying men in heroic scenes. Their bodies portrayed tattoos of dragons. mythical beasts, flowers, ferocious tigers and religious figures. Needless to say, the novel was a huge success and the demand for the types of illustrated tattoos increased significantly. Woodblock artists became the tattoo artists of the Edo period. A lot of the same equipment used for woodblock printing, was used on human flesh. There’s no need to point out that it was a really painful process I guess but still, yes it was really painful. 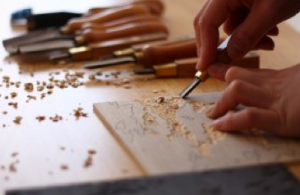 Apart from the chisels and gouges, the most important tool at their disposal was the Nara ink or Nara black. This is the famous tattoo ink that by time, the ink in the skin, turns from black to blue-green. 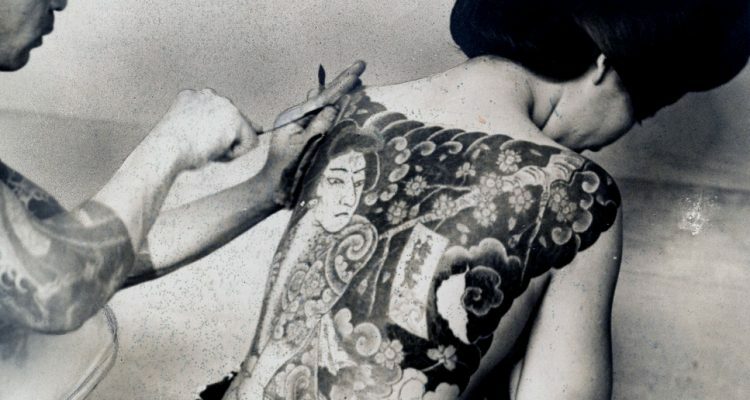 Some scholars state that Irezumi was wore by the lower class people whilst others claim that wealthy merchants wore expensive Irezumi under their clothes since the law prohibited them to flaunt their wealth. It is known for certain that Irezumi were associated with firemen, who wore them as a form of spiritual protection. Despite the majority of modern tattooing being done by needle gun, Irezumi is still done traditionally. Irezumi is still done via the traditional ways and it’s very hard to find these specialized tattooists. 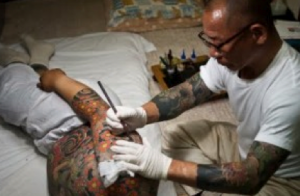 Unlike western style tattoo artists, the majority of traditional Irezumi artists aren’t located in the Tokyo area. It is a very painful, time-consuming and expensive process where for example a typical traditional body suit (covering the arms, back, upper legs and chest, but leaving an empty space down the center of the body) can take one to five years of weekly visits to complete and cost in excess of US$30,000. The process is also much more formal than western tattooing. Whereas western tattoo artists tend to do exactly what you request, traditional Irezumi artists tend to go back and forth with the customer and discuss what they would like the tattoo to look like as well as reserve the right to refuse service. Rather than electric guns, wooden handles and metal needles attached via silk thread are utilized. As you can see, the tattoo stigma is observed in several countries not only Malta. Unfortunately, such an impressive form of art should be pushed to bloom as Japan (as well as the whole world) is risking to lose such an impressive style.